This photo is from Podcamp Pittsburgh in 2006. One of the many things on my to do list for the blog is to revisit the idea of our very own t-shirt shop. I have long had a little shop with Spreadshirt, but I am not comfortable trying to promote t-shirts that were not actually here in Pittsburgh. I have been pondering the future of the blog, it is about to turn 12 this fall and if it is time to retire or recruit new bloggers or what should happen next (I am open to any and all ideas so them my way)! While I was in the shower this morning I was thinking about the t-shirt shop, I know that one of the first decisions to make would be what designs to sell. 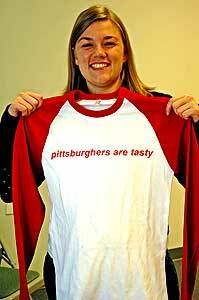 I was debating if the “Pittsburghers are tasty” design would still be popular. I got out of the shower, started my day and forgot all about the t-shirt design debate. Then I looked at the “on this day archives” and 9 years ago today, July 13, is the day that IheartPGH was featured with our friends from St. Louis, STLStyle, in a New York Times piece on t-shirts and rust belt cities. Never in my wildest dreams did I think that t-shirts and sharing Pittsburgh pride would land me a mention in the New York Times. I graduated from college and moved back to Pittsburgh after having sworn I would never move back home. I had a mostly boring office job (I know know that working for the largest auctioneer of dairy processing equipment, is not really boring – ask me about stainless steel food processing equipment and my visits to Dodge Nebraska, and to bring it full circle to the t-shirts my sister still wears the t-shirt I bought in Dodge, NE). I went to the Warhol Museum on a rainy Sunday afternoon and decided I would teach myself how to screen print. The first t-shirt I printed was an “IheartPGH” T-shirt. I still have the screens, not sure if they are useable, but I’ve kept them in case I ever need to get back into the screenprinting business. I picked up a flyer for Union Printing, what you now know as Commonwealth Press and likely sent an e-mail to Dan Rugh. This was back in the day of MySpace. I think it was even before texting. I was terribly shy and I sent Dan an email. We met for a coffee at the Beehive and talked about sustainable screen printing methods. In 2005 I worked on Bill Peduto’s first campaign, we had no money for t-shirts, so we used donated t-shirts, turned them inside out and printed Peduto for Pittsburgh on them at open studio night at Artist Image Resources. Commonwealth Press, which was located in Dan & Shannon’s house started printing all of the IheartPGH t-shirts. In 2005, again out of boredom, I started a blog. Mostly because my new friend Dave (one of the founders of Libsyn.com and now BossJock App) had volunteered everyday on Bill Peduto’s campaign and told me I needed to have an RSS feed. In the Summer of 2006, I was having lunch at the Union Project Cafe with my friend Pat. I asked him if he thought I could find work as a blogger. His reply “Don’t quit your day job.” In 2006, I was a regular at the Union Project Cafe which was run by the amazing Kate Romane. Kate went on to run e2, which was even more amazing and is now the proprietor of Black Radish Catering. 2006, a reader of the blog left a comment about how this company Spreadshirt was hiring for a Wizard of Web 2.0. I quit my day job and started my social media career as a Wizard of Web 2.0. What is even more amazing to me is how much has changed over the past 9 years. Pittsburgh has gone from being an occasional mention in a story about rust belt cities to being #1 on more lists about cities than I can even keep track of. 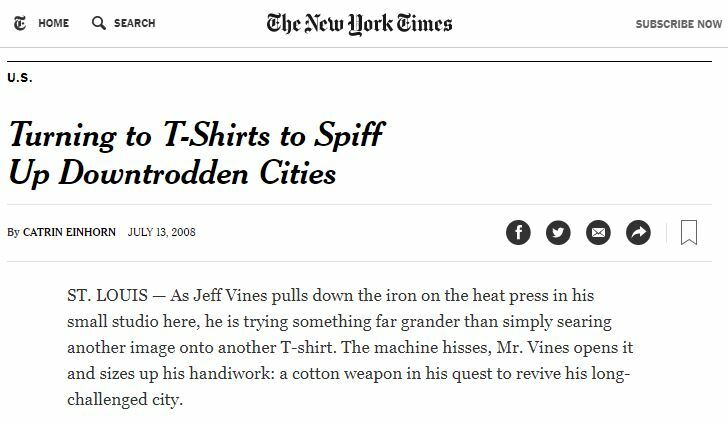 If you are new to Pittsburgh, or even nostalgic about Pittsburgh, take a moment to read the 2009 New York Times article – Turning to T-Shirts to Spiff Up Downtrodden Cities. It is an interesting comparison to how much has changed in the way we talk about cities (also some interesting changes in the businesses that existed and still exist today). No one would use the word “downtrodden” to describe Pittsburgh today. STLStyle is still printing out St. Louis gear, if you find your self in St. Louis stop by and say hi to Jeff and Randy, I can assure you there are some Pittsburgh stickers on the wall at their shop. Commonwealth Press is still printing t-shirts and has recently moved to a much bigger location in the Allentown Neighborhood. The Mayor of Pittsburgh is now featured in the New York Times on a regular basis. What is most striking to me, is the change in the language we use to describe Pittsburgh. No one would use the word “downtrodden” to describe Pittsburgh in 2017. Are there any cities that are currently described as “downtrodden”? The recent presidential election highlighted the distinct shift between the urban and non-urban areas of the country. I am curious how the way we talk about a place, impacts that place. This blog was started as a way to create a different narrative of Pittsburgh in 2006, to share the stories of the people and places that were here and thriving, even if those outside saw it otherwise. While I never thought I would move back to Pittsburgh, I also never thought of Pittsburgh as a place I couldn’t come back to. I almost always ask people who didn’t grow up in Pittsburgh if they would ever move back home. The answer is almost always no. I think that Pittsburgh has benefited from people coming and going, leaving for a bit before they boomerang back with some new ideas about other places do things. Was Pittsburgh every really downtrodden or is that just how non-Pittsburghers saw it from the outside? I would love to hear your thoughts on how Pittsburgh has changed over the past 9 years. I would also like to know what your favorite Pittsburgh t-shirt is and if you would buy a “Pittsburghers Are Tasty” t-shirt.